I don’t dream of living in a Gatsby-style, three-story home with a marble staircase and grand piano in the foyer. Nope, I dream of owning a Pinterest-inspired tiny house in a Colorado valley. In the summer, the nearby stream churns, and my miniature pigs frolic. In the winter, the snow glistens through my tiny windows. But snap back to reality. Plopping a tiny house in a Colorado valley and living happily ever after with my boyfriend and future cats (yes, multiple cats) won’t be so easy. Andrew and Gabriella Morrison have lived in a 207-square-foot tiny home for three years — before it was trendy. Andrew built the humble abode himself, and it rests peacefully in Oregon’s Rogue Valley. (There’s even a creek, too.) They teach workshops and lead courses to empower folks like me to build tiny homes and embrace the lifestyle. Oh, and they’re saving a ton of money. Because they’re in a smaller space and not paying a mortgage or utilities, Gabriella estimates they save about $3,600 a year. No wonder people are giddy over tiny houses. It’s a simple lifestyle with big savings. Unfortunately, the Morrisons have seen a lot of people jump onto the tiny bandwagon without fully considering the potential legal, financial and even psychological challenges. Gabriella says she most often sees people bail because they’ve underestimated the cost of construction. Tiny home, tiny budget, right? Not always. She also says many people don’t build a properly-sized home. Yes, sometimes the homes are a wee too small, but just as often, she says, the homes are too big. Be sure to keep these common mistakes in mind when venturing on your tiny journey. Andrew and Gabriella offer some valuable tips to help get you started. 1. Look into your town’s housing regulations. Although some areas have adjusted their zoning laws to allow people to permanently live in their tiny abodes, most areas have not. Andrew says the structures are generally categorized as RVs, which are considered temporary housing or recreational park homes. Sure, you can live in an RV if you’re moving around every so often — that’s recreational — but in most areas, you can’t permanently live in an RV. It’ll also take time. But how much exactly is going to depend on where you live and that area’s existing laws. Alongside architect Martin Hammer, Andrew recently drafted and submitted Appendix V for the 2018 International Residential Code. If this is adopted in your local community, this will act as a “model code” for permanent tiny homes and will make the laws a lot less murky. So before putting any money into your future tiny home, check your area’s zoning regulations if you plan to live there permanently. 2. Consider where your tiny abode will sit. Similar to housing regulations, you’ll need to decide if you want your tiny home to stay in one place or if you want to travel with it. For the Morrisons, they wanted to settle down somewhere. In fact, their plot of land in Oregon was their largest expense — another big consideration. But if you don’t want to purchase land, look into how much it’ll cost to rent that land or stay at an RV park. If you opt for something more temporary, take into account your transportation method (i.e. how will you tow your home? ), as well as any necessary “Wide Load” permits, which also cost money. 3. Map out your utilities. The Morrisons live off the grid, which means they don’t depend on public utilities. For electricity, they have six solar panels and four batteries, plus a generator for exceptionally cloudy days. For water, they have a private well. For heat, a propane delivery truck visits a couple times a year to fill their tanks. But for those who don’t opt to live off the grid, they’ll have to design their house so it can connect to land power wherever they might be parked. And those who want to travel with their home will need to set up everything with mobile capabilities — like an RV. If you’re going to DIY this tiny home, do your research. The internet is a great resource, full of discussion boards, video tutorials and advice. Tiny homes aren’t new, so there’s plenty of information out there. 4. Be willing to put in the emotional work. Andrew and Gabriella emphasize the amount of emotional work they had to put into their tiny lifestyle. Before they jumped into building a tiny home, they did a test run in a pop-up camper. Their first month in the camper was challenging, to say the least. Adjusting to a small space and limited belongings took some work. Gabriella calls it “emotional work.” You have to be willing to be potentially uncomfortable in the beginning — especially if you choose to live with a significant other. It’s not that you don’t love your S/O. It just might be that you usually turn your back to confrontation, which won’t be super easy to do in a tiny space. 5. Become more conscious of your consumer choices. 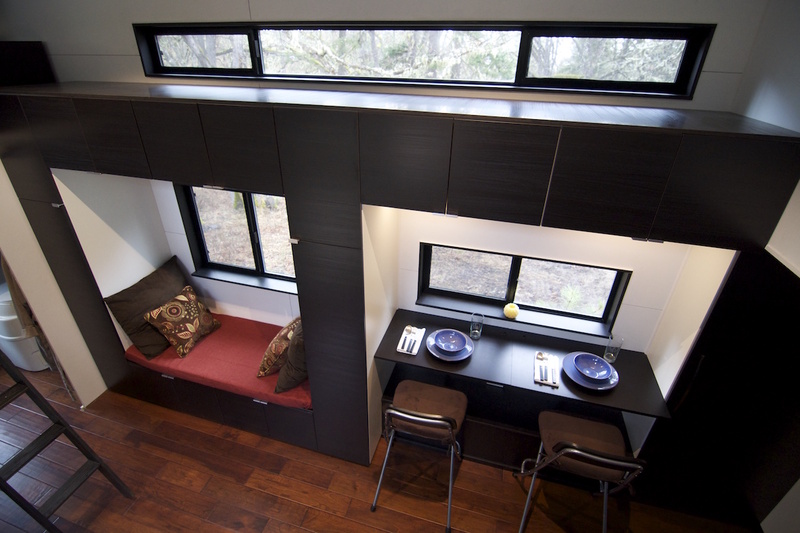 A tiny home calls for fewer material items. The Morrisons sold 80% of their belongings before leaping into their tiny world. Then Andrew shared the story about how he had to turn down a pair of free pants at the store. There’s no room for impulse buying in a tiny home. Your fridge will likely be smaller, too, so you’re stocking less food — and actually, probably eating it all. If you want to read about the Morrison’s tiny home build and transition, they opened up and shared their personal story with me. Your Turn: Considering the pros and cons of tiny houses, would you live in one? Carson Kohler (@CarsonKohler) is a junior writer at The Penny Hoarder. She plans to test out the tiny lifestyle by staying in a tiny Airbnb.